● The Law of Conservation of Energy states that energy cannot be created nor destroyed. ● Energy can be transformed from one form into another, but the total amount of energy never changes. ● When water is behind a dam, it has potential energy. The potential energy of the water changes to kinetic energy in the movement of the water as it flows over the dam. ● When a rubber band is stretched, kinetic energy is transformed into potential energy. The further back you stretch the rubber band, the greater potential energy, and the more energy that will be transferred as kinetic energy. When a stretched rubber band is released its potential energy is transformed into kinetic energy as the rubber band moves. ● When a book is lifted to a shelf, kinetic energy is transformed into potential energy. If the book falls off the shelf the potential energy is transformed to kinetic energy. ● Transformations may occur between any of the various types of energy but energy itself is never lost. ● The potential energy that a book on a shelf has is from the kinetic energy it took to lift the book to the shelf. ● A swing pendulum (such as a Newton’s cradle) also demonstrates how energy is conserved as it changes forms. ○ Kinetic energy is used to pull a ball back; this energy is transformed into potential energy. ○ The ball is released and the ball swings back toward the other three balls (kinetic energy). ○ The moving ball strikes the stationary ball and the kinetic energy is transferred from one ball to the next. ○ The last ball swings away from the others because of the kinetic energy that was transferred to the ball. ○ If this experiment is repeated by pulling back two balls, then two balls will swing off of the other end. ○ This shows conservation of energy because one ball has enough potential energy to cause one ball to move; two balls cause two to moves, and so on. ● Although energy is not lost during energy transformations, some is transformed into heat and friction. This means that all of the potential energy stored in a book is not going to be transformed into kinetic energy. 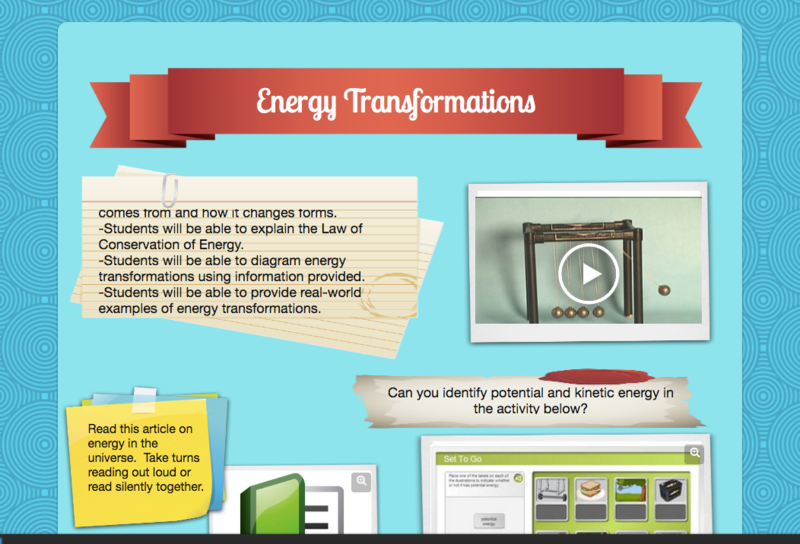 Sign into discovery ed and type " Energy Transformations" and "The Law of Conservation" in the search bar. Click on Advanced Search and select "Boards" under media type. Click on the pic on the right for quick access. What are the types of energy transfers that occur by using the air cannon? Click on this button to see the roller coaster. This only works on PCs and Macs.